We can very easily get caught up with the here and now. Will Italy bring down the European dream, will Trump destroy global growth; is it a pipedream to assume countries like Rwanda could ever grow to become great global economies? If I read the press then the answers will likely be yes to all of them! But as is the nature of my job, we sometimes must look beyond the headlines and look to the future. Am I an optimist? Well, like Hans Rosling I am more a possibilist. Anything is possible (in theory)! The G7 summit ended with a serious spat between Trump and Trudeau; the latter under pressure at home responded to the US by saying Canada “will not be pushed around”. Trump responded on twitter by calling him “dishonest and weak”. We don’t know where all this positioning will lead, but it was amusing when a few days later it was announced that the USA, Canada and Mexico would host the 2026 World Cup. Trump was quick to tweet “The U.S., together with Mexico and Canada, just got the World Cup. Congratulations – a great deal of hard work!”. Somehow, these three countries must come to together over the next eight years. As it stands they cannot seem further apart, and there will be a lot of hard work involved to pull this off, which should happen. More importantly the spat over trade tariffs will likely dissipate and end up as no more than a storm in a tea cup. This feels like Trump is stealing the introduction, but it is worth asking the question as to whether he is a genius. This might seem a strange question, and don’t get me wrong I am not a fan. Trump isn’t a politician, he runs the country like he would run his business empire; often starting from what seems a stupid position before coming to a position that he always had in mind. I am going to spend some time in this report looking at the emerging economies and why we shouldn’t ignore their growth and North Korea has the potential to fall into this. I have often thought North Korea had a hidden agenda; was the idea of Nuclear War more about having a bargaining chip, because if it was then it has potentially worked. Trump meeting with Kim Jong-Un could be a stroke of genius. This might seem a little crazy but if North Korea starts to change and develop, who knows where they will be in ten or twenty years’ time. If North Korea is welcomed back and sanctions are lifted, then over time they could become a valuable trade partner. Those who are early to the party are more likely to benefit and although the US is unlikely to see any immediate benefit from this meeting, over the long term it could be. The FTSE 100 started the year at 7,695, towards the end of March it had dropped to 6,888 (down nearly 10%), the FTSE is currently hovering around the peak for the year. This is volatility returning to the market and these levels of falls by any extreme must represent a clear out in the market. In 2008, and 2011 when the markets dropped there wasn’t anything left to drive the markets back up, it is different now. In the short term there are concerns over oil prices, trade etc but generally the global economies are doing well. It is worth adding that in 2017 you could have invested anywhere and almost certainly achieved a positive return, in 2018 it is much harder and that is reflective of volatility and a more normalised market. Just pushing the message about the global economy, global growth is expected to be around 3.4% this year. The UK is around 1.6%, and the US 2.9%. The top ten counties are Libya (16.4%), Ethiopia (8.5%), India (7.4%), Cote d’Ivoire (7.4%), Rwanda (7.2%), Bhutan (7.1%), Senegal (7%), Macao SAR (7%), Bangladesh (7%) and Myanmar (6.9%). This really shows that over the next few years we will see a shift in which economies drive global growth and we will touch on this in more detail. The message is no different to the previous report, 2018 will feel a little more uncomfortable compared to 2017 but this is normal activity. Volatility doesn’t mean the year will be negative and we shouldn’t ignore the fact that it still feels like the early stages of a proper recovery. In the long-term Mexico, Canada and the US must work together so compromises will be found. North Korea could become a valuable trading partner in the future and so on. Of course, there are risks, and the biggest is that which we don’t know about! When I come to write the developed market review it often feels outdated and lacking any energy. When I look at the GDP figures you can see that the growth is not in developed economies but in emerging and frontier economies. It is therefore hard to get excited about Europe, the US and the UK but I will try and impart some wisdom. There is no escaping the fact that the UK is in a mess. Brexit will drift in and out of the news; what is clear is that this not only tearing up families but also the political arena. Labour, far from being a government in waiting, are now as split as the Tory party and there seems no end in sight. It is worth adding that the last major treaty was the Treaty of Lisbon and that took almost 9 years to put in place! It started in 2001 and finally became effective in 2009. Two years for the UK to leave EU seems a little optimistic. It doesn’t seem like rocket science to work out that leaving the EU is going to be messy and complicated. How we think we can end up with a better deal is staggering! But once everything is in place perhaps it will be fine. The consumer is worried; big ticket sales are down, and people are starting to realise that leaving the EU is unlikely to be what they expect it to be. There are worries that the UK could fall into a recession. Wages are going up, but these are long overdue for many, and the benefit of this may take time to filter through. At the same time debt is a problem in the UK and people are worried about rising rates. The uncertainty around what the Bank of England might do doesn’t help the consumer. There are expectations of at least one rate rise this year and perhaps two next year. This will slow house prices. A slump in house price growth is real and other than in London and South East, there are fears this will filter across the country which reflects poor sentiment. Buy-to-let investors have had to endure an increase in stamp duty and a tightening of mortgage tax relief. If the slump gathers momentum, then history suggests it will take years to halt the decline. This is not only negative for consumers but also lenders and public finances through lower tax revenue from property transactions. Consumers are also battling inflation at 2.4%, and oil is up nearly 10% this year. We are also seeing the high street retail sector collapse, and there is evidence that the construction industry is in recession and the service industry is far from happy. But perhaps not everything is doom and gloom, there is evidence that companies are just getting on with it. 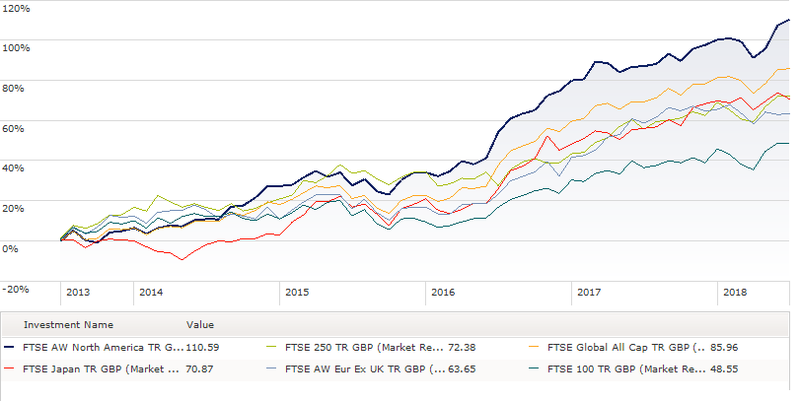 The FTSE 100 is riding high as the pound weakens and this benefits many of the companies in the FTSE 100 which are global with overseas earnings. This is important because although the UK consumer might be struggling UK global companies are benefiting from a weaker pound. The UK growth figures put them at the lower end of global growth table, well below the average. Although we would like to think that the EU are working hard solely on sorting out the UK leaving the bloc, this is unlikely. They have had something like 7 to 8 treaties to sort out since the end of the second World War and based on the Treaty of Lisbon this is not going to be a quick process. Macron is showing himself as a new breed of dynamic and positive leader in Europe and he will be at the forefront of what will eventually come to pass. The UK press seems to be hoping that the EU will collapse, and is focusing on the problems in Italy, which has had over 60 governments since the Second World War. There is very little chance that they will get an agreement through parliament to hold a referendum and it seems that the odds of the population voting to leave is low. What is more likely is that the government will collapse, and fresh elections called. If we are honest the bull market in Europe has not been an enjoyable one; plenty of false starts. But at last we are seeing earnings growth come through which is helping to drive the market. Companies have de-leveraged about as far as they can, and they have capital to spend. The consumer is in a far better place than 12 months ago, and unemployment is coming down. Some of the countries to watch include France, Italy and Spain. In Germany, household consumption and investment grew at its fastest pace since Q2 2017, the only weakness was from Government consumption which contracted for the second time in five years. Germany could be hit if exporters in Asia decide to pull back on capital expenditure on the back of trade sanctions. In the battle for tariffs an easy win for Europe would be to go for the big four US tech firms by tightening down on tax revenues and imposing stiffer regulations. The Trump show is very hard to ignore with all the noise and to therefore find out what is really happening. Christine Lagarde, Managing Director of the IMF made a good point that there are never really any winners when it comes to trade wars. Tariffs go against everything the US has done over the last 100 years, they are not positive for markets and especially for global trade. This has the potential to damage the US as much as the global economy, but we must assume this is a game that Trump assumes he can win. We can expect a lot of noise but eventually agreements will be made, and things will calm down. We must remember that Trump is facing mid term elections which he cannot afford to lose. This noise and posturing he obviously believes will help his chances of winning. Time will tell whether his gamble pays off. In terms of the economy, good earnings data is coming through and we haven’t really seen the benefits of the fiscal package and what the different outcomes from this will be. Unemployment is down, and the consumer is in a strong place. The Fed raised rates again and there was a more hawkish tone meaning that expectations are that the normalised rate could be as high as 3.5%. With the economy doing well there are always murmurings that a recession is on the cards, some are pointing to 2020 as the likely date. The reality is that recessions always happen at some point, that is a fact of life. We haven’t really seen the benefits of the tax stimulus and we don’t know the impact of the tariffs, the reality is that we can only guess when a recession might hit. If the benefits of the tax stimulus come through in 2019 and the battle over tariffs dissipates then the US could have a positive run for a few years yet. If the reverse happens and tariffs damage the economy, rates are raised too quickly then this could bring forward the chances of a recession. The reality is that we just don’t know. Finally, on the US the oil spot price has risen 17% this year; with the US now the third largest producer behind Saudi Arabia and Russia. They have moved to a small deficit from a much larger deficit in 2009. Being self sufficient with oil is good news for the US economy. Touching very briefly on Japan; the economy continues to recover from its long post-bubble slump. Unemployment is continuing to fall but there are risks that growth could slow if oil prices continue to rise. In summary, tariffs in the short term are a concern but is more likely that a resolution will be found before permanent damage is caused. Europe, the US and Japan are doing well and growing. The UK is sluggish. We need to watch how the tariff game plays out, and see whether oil prices keep rising or start to fall back. Naturally when it comes to investing we get drawn into short-term noise, we lose sight of what is happening and how the world is changing around us. Whilst it is difficult to get excited about developed economies, developing economies are so much more interesting. They tend to be younger and more dynamic. They are the countries that many developed economies were 30 or 40 years ago, which means they have plenty of time to catch up. They are also the economies that get the most criticism because they don’t always do things the western way! An acquaintance recently returned from China, he explained that after spending two weeks in the mountains with Monks he was craving western food. On returning to Shanghai he quickly found a McDonalds and went to order some food; two things differed from the McDonalds back home. Firstly, there was no till (everything was ordered via a machine), and secondly there was no means of cash payment or card, it was all via an app on the phone. When travelling through China he went on a 5-hour journey on a high-speed train enabling him to see a lot of the new infrastructure across the country. He also observed that many Chinese people had the Huawei P20 Pro smartphone which has taken the best bits from Apple’s iPhone and made it better. I love stories like this. Recently I spoke to a fund manager who had just returned from India and he was explaining that even in the markets, traders operate without cash and payments are via phone apps. Can we imagine in the UK everything being cashless, can we imagine super slick infrastructure and not being wed to the Apple ecosystem? These economies are adapting technology at a much faster pace compared to developed economies and many are being left behind. Much of the growth from these economies is coming internally as people move up the wealth scale and aspirations change, which is where developed economies. They must contend with outdated infrastructure without any real means to change things. A recent study by PWC expected the top ten global economies to include; China, India, US Indonesia, Brazil, Russia, Mexico, Japan, Germany and the UK. This would mean 4 of the top 5 would come from so called emerging or developing economies. This is currently made up of just 2. In terms of the top ten this would be 6 and is currently 5. Vietnam is expected to move up 12 places to 20th, Philippines 9 places to 19th and Nigeria 8 places to 14th. Half of the population of Vietnam is under 35. Income levels are rising, and the growing middle class is spending; retail sales are up 10.9% and they make 1 in 10 of all the smartphones in the world. The stock market is growing, and foreign investors are starting to invest in the market. One of the biggest recent changes is the relaxation of foreign ownership. GDP growth is 6.6%. Turning to Africa, Rwanda recently agreed a deal to promote their tourism industry on Arsenal football shirts. There is a view that Africa is destined to be poor and corrupt and yet Tunisia, Algeria, Morocco, Libya and Egypt now have life expectancy matching Sweden in the 1970s, and strong growth numbers. Rwanda is cutting its dependency on foreign aid; it has seen infant mortality fall from 114.6 deaths per thousand to 38.5 which is still high, but its speed of travel also represents astonishing progress. It is very easy to forget that extreme poverty existed in Europe 90 years ago, and in some places just 40 years ago. 50 years ago, places like China, India and South Korea were in most ways all far behind where sub-Saharan Africa is today. Rwanda has an 80% literacy rate and 89% of girls attend primary school. Kigali is one of the cleanest cities in the world. GDP growth is 7.2%. The world in the next 30 years will be very different to what we see today as these younger, more dynamic economies take greater dominance on the world stage. It seems strange when we see the US talking to North Korea but if the economy opens in the same way as China has or Vietnam then actually engaging with them now seems a sensible option. Those economies supporting them at the early stages of development are more likely to benefit in the long term. In the short term there are concerns on trade wars. Mexico as an example saw Trump impose tariffs on steel and aluminium imports. Mexico responded with several tariffs including a 20% tariff on exported US pork to Mexico, which is the largest market for US exporters. It is also a net importer of US Steel and has placed a 25% duty on American steel products, which worries Americans in case Mexico start going elsewhere to get their supplies. In Asia, there are some concerns but many of the economies have stronger trade with their neighbours than they do with the US. A trade war could slow global growth but ultimately it doesn’t change what is happening globally with many of these economies. Long term these developing economies will become the global power houses. Of course, we can paint a very rosy picture. There are challenges with many of these economies and many are perhaps 20 or 30 years behind those of developed economies. But we easily forget that we have been in that place. There are political challenges and corruption in some developing economies but again developed economies, cannot claim to be perfect. There is also the argument that companies in developing economies are corrupt or poorly run. We seem desperate to impose Western values on these economies and assume because they don’t follow our way they can’t succeed. When I look down the list of collapsing companies in the UK (Homebase, House of Fraser, Debenhams, Poundworld, Claire’s, New Look, Toys R US, Maplin, Conviviality Booze, Mothercare, Carpetright, Moss Bros etc), we can’t point a finger at developing economies when developed economies have the same concerns and problems. It is true that many Asian companies are still owned by families, but this is not dissimilar to early stages of development in the UK and US. Some family businesses aren’t great with governance, with little care of minority shareholders. Korea is a prime example of this with five families controlling most of the big businesses in the country. But things are changing, Samsung has increased the pay-out ratio from 5% to 20%. Across Asia the pay-out ratio has increased to 32% which is behind the global average of 47% but it is an improving journey, especially when the number of companies paying dividends has increased significantly. We are sure however if the data, especially in China, is fudged. The GDP figures come out 12 days after the quarter end and with a country of that size it doesn’t sound right. The figures lack variance and there is evidence that local government must report higher figures. So, there is some truth to this, but the GDP tends to focus on old China not fully capturing consumption and servicing. Sometimes it means looking at other data to get the right picture. BlackRock recently analysed 3,000 companies in China and found that only 3.8% couldn’t afford the interest on their loans. This has reduced significantly, as their research showed this as high as 25% in the past. Debt is high in China but not as high as the UK and Japan and just because there has been a sharp rise, it doesn’t mean it will continue. Another argument is that these economies can’t change. India under Modi has seen the goods and services tax, demonetization, improvements for foreign direct investment, bankruptcy laws, improvements in doing business, banking reforms, food inflation, improved labour market and changes to the energy sector. Change can happen, but it takes time and the right government. In summary, over the long term this part of the world (on paper) shows greater opportunities and is expected to be more dominant in the next 30 years. We should expect many economies to catch up with the developed world as technology is different and enables change to happen at a faster pace. Trade wars are a concern but ultimately this is likely to be short term and focus should always be over the long term. On tariffs it is worth adding that the region is more self-contained than many think; yes many are reliant on China but trading is booming across the region. Inflation is around 2.4%, the increase in oil doesn’t seem to have impacted inflation yet. The question is whether this will start rising again and therefore further eroding any potential “returns” from holding cash. Cash investors are looking longingly at the Bank of England who seem poor at predicting the future. The odds were in favour of two rate rises this year and two next year bring interest rates to 1.50%. It was unlikely all of this would be passed onto savers but for the first time it seemed that something positive was coming to the beleaguered cash market. But, the Bank of England decided not to raise rates in May and it now seems set for either August or November. The reality is that 1.5% by the end of 2019 now seems unlikely. The problem is that the Bank of England is in a catch 22 situation. Debt is growing in the UK, if rates are raised then it stifles borrowing which keeps the economy going and potential tips the housing market into freefall but equally the Bank of England want to curb consumer borrowing and they want the ability to reduce rates if the UK needs some stimulus. If I am honest I am not sure which way I would go other than the UK is finely balanced and anything that tips it over the edge is not good for the economy. Generally, the world is not in a bad place, there are many positives but equally there are challenges. Trade tariffs in the short term are unhelpful but we guess deals will be struck and, in a few months, there will be something else to worry about. A 17% increase in oil will hit some economies harder than others, and if it rises above the $100 mark this could be a concern for the global economy as it will push inflation higher and drive down growth. We can list so many concerns for the global economy but the biggest is that which we don’t know. If we look at the data, there is growth; there are country concerns, but there are always country concerns and assuming the tariffs are rectified, and oil doesn’t rocket away then we can expect the markets to slowly grind upwards. There remains pockets of the world where growth is strong especially in the developing economies, they carry more risk, but they are catching up and the world will be very different in the next 30 years. To finish, BlackRock recently published their capital market assumptions and they expect bond returns to be around 3% with volatility between 5% and 10%, and equity returns around 7% with volatility between 15% and 20%. The main takeaway from this is that we can expect positive returns over the next ten years, but there will be down periods and it will be more volatile. What we can’t expect is the same levels of returns as we have seen in the past.